So, after more than a year of blogging, I've finally decided to buy my own domain name. Yes, I know - it's about damn time. 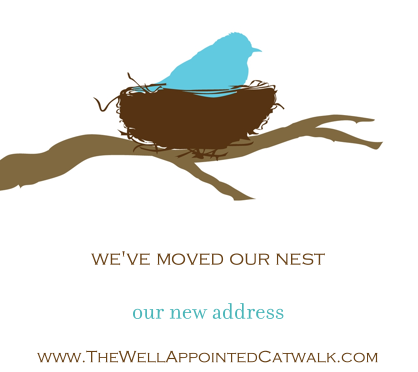 So, The Well-Appointed Catwalk is now located at www.thewellappointedcatwalk.com. Blogger will redirect you automatically within the next few days, and you will be able to access everything at the old blogspot address in the meantime. No need for you to change a thing unless I am on your blogroll, in which case I would love for you to update your link. If you see anything funky going on over the next few days, feel free to let me know! Thanks again to all of you for following and taking interest in my silly musings. Hopefully, this is just the beginning of changes for the better.